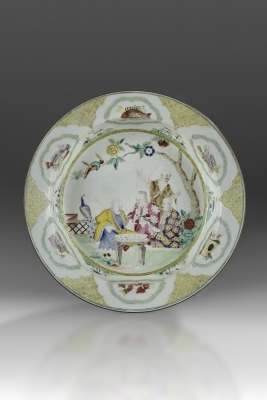 The central design of this dish is known as “The Four Doctors” or “The Four Doctor’s Visit to the Emperor” and is considered the most artistic of the four designs made by Cornelis Pronk (1691 – 1759) . 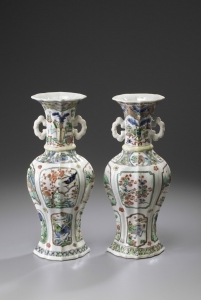 Ever growing demand for Chinese porcelain in the Netherlands, encouraged the Directors of the Dutch East India Company to commission four designs for porcelain decoration by Cornelis Pronk in 1734 . ``The Four Doctors” is the second design of which there are two versions. The first version, as seen here, shows three men sitting down and a standing figure in the back. In the second version, the standing figure has been removed. 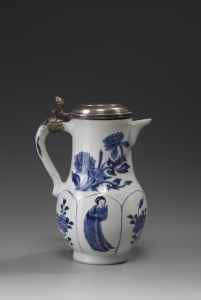 This design was produced in underglaze blue and white, as well as in various combinations of enamels. 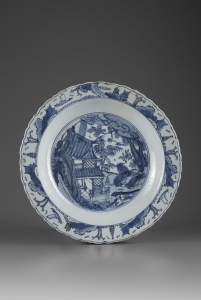 In total, 15 dinner sets of 371 pieces were ordered and shipped to the Netherlands: 7 in underglaze blue and white, 6 in enamels and 2 in Imari . The first illustration of “The Four Doctors”, but of the second version with three seated men, was recorded as early as 1862 by Jacquemart and Le Blant in Histoire de la Porcelaine . 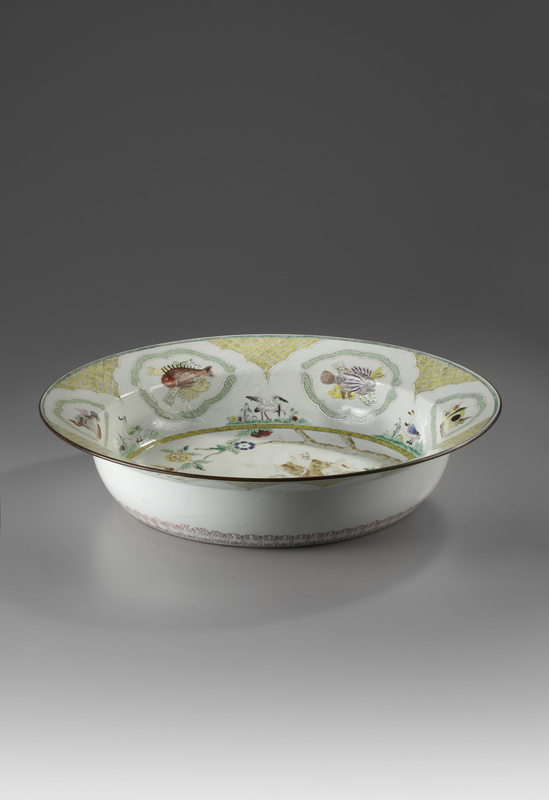 A dish in the same enamels is in the Hodroff collection .